"Engineering Solutions to Advance your Business"
BTP provides a full range of consulting services for Dynamics™ GP, including streamlining your Chart of Accounts, developing dynamic reports with FRX and Management Reporter, Olap Cubes and Excel Pivot Tables, and implementing top to bottom financial solutions with the Microsoft stack. Our robust products and solutions for Dynamics™ GP are designed to make your business more efficient and save you money. Easy e-Bank Rec™ is the ultimate solution to Bank Reconciliation problems in Microsoft Dynamics™ GP. Easy e-Accounting™ is a user-friendly web interface to Microsoft Dynamics™ GP. Reports Manager is an engine for creating and displaying custom reports queries. 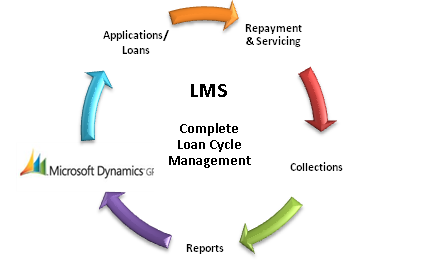 Loan Management System is a full loan cycle management system that integrates seamlessly with Microsoft Dynamics™ GP. BTP excels at full life cycle development of custom applications that integrate with Microsoft Dynamics™ GP. We specialize in solutions that are adaptable and flexible, taking the best of today's technologies and applying them to your business needs. We develop customized products that will keep you ahead of the competition. You’re invested in achieving the vision for your business. It’s the key to your prosperity. Microsoft Dynamics™ GP is the solution you need to get there. Providing visibility into your business, Dynamics™ GP gives you control and the ability to make business decisions that increase your profitability and enhance your cash flow - powering your growth and success. Today, more than 300,000 customers are using Microsoft Dynamics™ GP solutions to drive business success—and stay ahead of the competition. Keeping up with the maintenance and continuing education of your Microsoft Dynamics™ GP application can be daunting. We have tailored a program to administer your SQL database, install upgrades and patches, and offer ongoing training. BTP provides a full range of consulting services, including streamlining your Chart of Accounts, developing dynamic reports with Reports Manager, Olap Cubes and Excel Pivot Tables, and implementing top to bottom financial solutions with the Microsoft stack. BTP follows a tried and true consultative approach to facilitate the implementation of Dynamics™ GP and the conversion of your data from your legacy system. This process includes streamlining and normalizing the Chart of Accounts for the new system (if requested by the client) and determining the appropriate tool to migrate the data (modules) from the legacy system to Dynamics™ GP. Fields are mapped to Dynamics™ GP in consultation with the client, and adjustments are made accordingly. BTP tests a data extraction from the legacy system and confirms that the extracted file is ready for the conversion tool. BTP employs a two-step process to ensure there are no issues with the data conversion. First we do a test conversion, extracting, massaging and mapping one month’s data to Dynamics™ GP. When we’ve determined the conversion is accurate, we follow the same procedure with the complete data set and test the reports. When we have ensured that the test conversion has been successful and accurate, we perform a final conversion following the same steps. BTP offers user training for a full complement of Dynamics™ GP modules and functions. BTP customizes Dynamics™ GP to work for you by using Microsoft technologies such as Report Writer, Modifier with VBA, and Visual Studio Tools. We integrate and connect other Systems with Microsoft Dynamics™ GP using e-Connect, Integration Manager, SmartConnect, Web Services and Direct Data Access where applicable. BTP specializes in developing custom reports using Crystal Reports, SSRS, SmartLlist Builder, Excel Reporting, FRx Reporting, and Management Reporter. We’ll create SSAS Cubes to display your data to your specifications. Easy e-Bank Rec™ is the ultimate solution to Bank Reconciliation problems in Microsoft Dynamics™ GP. It is fast and easy to use. With Easy e-Bank Rec™, bank reconciliations usually take between 5 to 10 minutes to process, regardless of transaction volume. In 7 quick steps your work is finished! Fill in the form below and click the "Submit Request" button. A Sales Representative at BTP Technologies will get back to you to schedule a live demo. BTP Technologies, LLC has created Easy e-Bank Rec™ - the ultimate solution to Bank Reconciliation problems in Microsoft Dynamics™ GP. It is fast and very easy to use. Reconcile your bank statement in 7 quick steps! Fill in the form below and click the Download button to receive a trial version that can be installed on the Dynamics™ GP test company and is valid for 30 days. Easy e-Accounting™ is a user-friendly web interface to Microsoft Dynamics™ GP Accounts Receivable, Accounts Payable, Cash Receipts & Deposit modules. It allows users in remote locations to enter transactions and upload corresponding scanned images of invoices and cash receipts. The application creates unposted AP and AR batches on the Microsoft Dynamics™ GP server. The images are stored on a secure location on the network and can be retrieved from the Transaction Entry and Inquiry window in GP as well as the Easy e-Accounting™ web interface. Leverage your Microsoft Dynamics™ GP application without having to purchase additional GP user seats. Microsoft DCO user licenses are required. Use the application in remote locations or within an intranet. Go completely paperless with the imaging feature in Easy e-Accounting™. Save money by eliminating bulky courier deliveries of AP and AR documents from your remote locations. Create customer records on the fly in the Easy e-Accounting™ AR module. 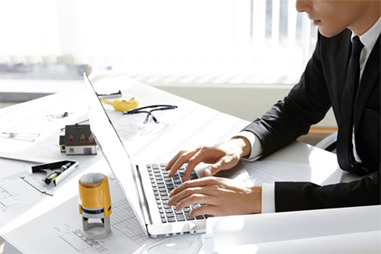 Create quotes, orders and invoices with the touch of a button. Ensure the smooth flow of financial information across your business. The application uses Microsoft Dynamics™ e-Connect to create unposted AP and AR batches on the Microsoft Dynamics™ GP server. The document images are stored on a secure location on the network and can be retrieved directly from the Microsoft Dynamics™ GP Transaction Entry and Inquiry window, or you can retrieve them from Easy e-Accounting™. Reports Manager is an engine for creating and displaying custom reports queries from the data in Dynamics GP. You can view your accounting data, slice and dice it, create Cube and SQL reports, export them to excel and create custom layouts. The flexibility of Reports Manager allows you to create custom reports on the fly. For example, we’ve developed reports like the General Ledger Trial Balance in Summary and Detail with automatic year-end closing without physically closing the year in GP. The BTP Loan Management System (LMS) integrates seamlessly with Microsoft Dynamics™ GP at the back-end and has been designed with user interfaces that have the look and feel of Microsoft. LMS is not dependent upon Samaritan or other data collection software to operate and can be easily customized for commercial lending processes. "BTP provided great support in getting the Speedway to reconcile all of our Chase bank accounts. It reduced our reconcilliation time by over 90%." "Several of our customers have purchased the Easy e-Bank Rec product from BTP, and have found it to be an excellent tool for reconciling their GP checkbooks. It works seamlessly with GP and is especially helpful for large checkbooks. I have heard nothing but good things from our customers that are using it." BTP puts it all together - hardware, software, networking, training and support - to create a robust and flexible system that will serve you for years to come. We've developed a comprehensive suite of solutions for supporting and managing your existing LAN/WAN network. The services range from outsourcing to remote system management to hosting of your servers and applications. BTP specializes in helping organizations to plan their financial systems and to select the right tools to get the job done. 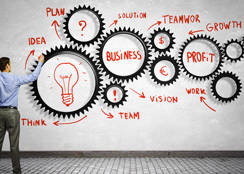 We focus on creating solutions that are adaptable and flexible, taking the best of today's technologies and applying them to our customers' unique business needs. We are a team-oriented, professional organization dedicated to providing the highest level of customer satisfaction. The BTP staff has more than 100 years of collective experience and knowledge in developing and enhancing custom software systems that leverage new technologies to keep our customers ahead of the competition. In 2011, BTP Technologies, LLC (BTP) acquired the core business of GPC Systems, Inc., a Microsoft partner that has developed, maintained, and enhanced custom software systems for Microsoft Dynamics™ GP applications for businesses and organizations throughout the Washington D.C. area for more than 25 years. Although the company name and address have changed, our commitment to our customers remains. Q: The Great Plains Bank Reconciliation is quite simple and allows for range marking of cleared items. What benefit does Easy e-Bank RecTM have that significantly outweighs the existing system? A: If you have 50 checks, marking cleared items is not an issue. When you have 300 or 5000, then it starts to become more complicated. Easy e-Bank RecTM has a one-click feature that performs all of the check marks in the Great Plains bank reconciliation. You no longer have to match the paper statement one click at a time. Moreover, when you import the bank tape, Easy e-Bank RecTM automatically matches all items. You can click a button that will display only non-matches (hence, not reconciled) and therefore, only deal with items that require attention. We visually show you what is matching and not matching. The more Easy e-Bank RecTM does, the less you have to do! Q: Often the checks in GP start with a 0. But the bank drops the 0 so how would the matching occur in this instance? A: Easy e-Bank Rec TM is built in such a way that the zeros are NOT dropped at the import. The Preview Checks or Deposits Matching will actually strip leading zeroes and do the matching for you. Q: If the checks are off by 1 number (as experience has proved happens periodically), how difficult does the reconciliation become? A: Great idea! In Easy e-Bank Rec™, you can modify the user input of the bank number by copying it over from the previous record or just change the last digit. However, to be able to specify a shift of 1 number for a range is a great idea. That one goes in the suggestion box ASAP. Thank you! How about if we allow you to select the starting and ending check number and adjust all document numbers by 1 or -1! Q: Once researched, unreconciled items are easily dealt with in Great Plains. The adjustment page of the Great Plains reconciliation process accounts for interest and service charges quite easily. A: True - for those two instances, but they are not booked in the GL and hence the Bank to GL reconciliation is not complete until the reconcile button is hit. Easy e-Bank Rec™ automatically books those and other kinds of charges so no manual entry is needed and they are 100% accurate. For example, BAI code 354 is an "Interest Credit" - usually the interest received on the bank statement. Easy e-Bank Rec will book these transactions automatically. The same is true for service charges, ZBAs and Sweeps. Q: Do you still need to process deposits to get them into the reconciliation or does Easy e-Bank Rec™ do it for you? At our business, because of our daily credit card processing, this is the most time consuming part of the reconciliation process. A: I suspect you have credit cards that are settled and the resulting batches are wired to the account by the merchant account processor. The actual wire or deposit already can be booked automatically by Easy e-Bank Rec, as it allows you to identify which entries on the bank tape can create automatic transactions in the bank reconciliation module. The part that would have to be added is to allow the credit card receipts to be matched to those deposits. We are currently working on that process. Give us a ring and we will be happy to make it work for you! Q:I would be more interested in seeing a product that allows import of checks from another system into Great Plains so that bank reconciliation can be accomplished more easily. A: We have SQL statements that do this immediately. If you give us an export file, we can automate this function for you and would include it in your bank reconciliation. The import would allow you to record a bank transaction entry and post to the GL without re-keying. Q: Can Easy e-Bank Rec™ import bank statements from non-U.S. banks? A: Yes. We will build one custom bank connection free of charge with the license purchase. All we need from you is the document number, date, amount and uniform transaction description, preferably a code. Q: Do I need any other software besides Great Plains to use Easy e-Bank Rec? 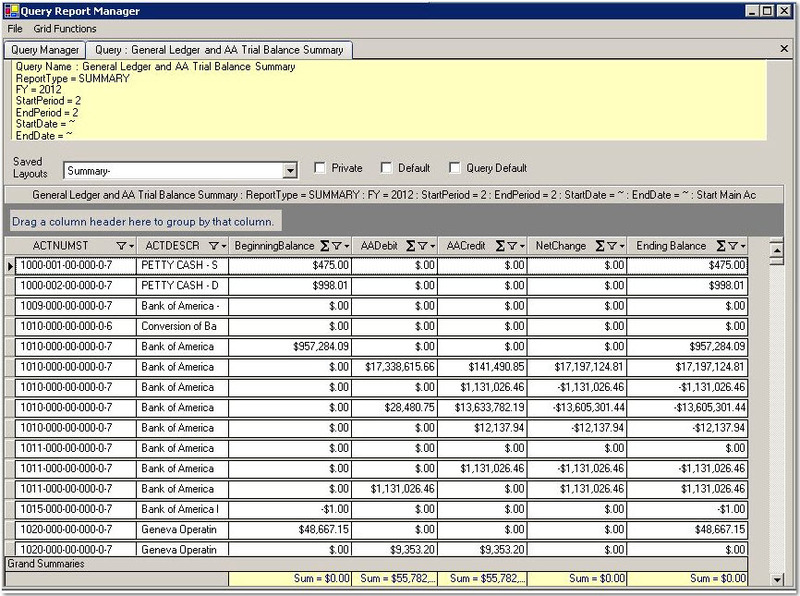 Easy e-Bank Rec™ will work with GP 7.5, 8.0, 9.0, 10.0, 2010, and 2013 and is compatible with SQL 2000, SQL 2005, and SQL 2008 R2. It will also work with databases that have enabled the binary sort. Q: Which file formats does Easy e-Bank Rec™ support for the bank tape import? A: The BAI File format is the preferred method. Depending on your bank's implementation of the BAI standard, it can include all of your bank accounts in a single download. This makes it easy, as you only have to perform one import from the bank. By the way, Easy e-Bank Rec™ will import only the bank account that matches the check book ID in Microsoft Dynamics™ GP. IF File (Quicken Interface Format)is also supported, preferably with a BAI Code. Version 9.0 of Easy e-Bank Rec™ provides the option to set up your own import with CSV, TAB, or an Excel file. When necessary, we can also build a custom import for a small fee. We have even imported bank tape data from a web report! A: BAI information can be obtained from http://www.bai.org. Q: How can I view the detail comments on the bank tape? What do I do if the bank tape transactions have the same number? If there is a number on the button to the right of the transaction instead of an ellipse, it means there are multiple transactions with the same document number on the bank tape. To view individual transactions, click on the button. Enter a starting check or deposit number or a zero in the field to the left of the Auto Update Button. 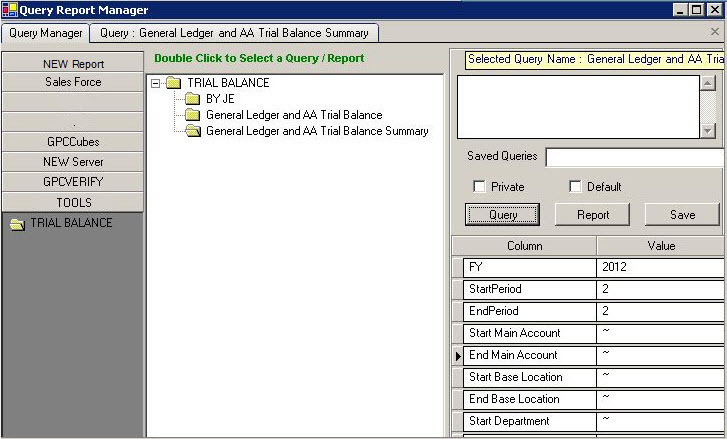 Then click on Auto Update to split the bank tape transaction grouping into its component transactions. Scholarship management program for a leading educational foundation. Part sourcing and quote/order processing program for a broker of military aeronautical parts. Front-end data collection system for loan applicant information for two military aid organizations. Many Dynamics™ GP add-ins using tools that integrate with GP to add functionality. For example, we’ve created an add-in for automatically importing currency exchange rates into GP from OANDA, and performing currency validations. We've been creating solutions for over 20 years that allow companies to draw and disseminate data from external applications. We unlock and deliver critical business information stored in legacy systems. Using this powerful and flexible backend, BTP has developed large relational databases that receive millions of records on a daily basis and replicate to locations across the country. BTP excels at examining and parsing your data to convert your business capabilities into knowledge, develop strategies for increasing business, compete effectively in the marketplace and plan for long term growth and stability. Our customized Reporting Solutions help you analyze your historical and present information with Cubes, Enhanced GP Cubes with AA, and SSRS reports so you can plan effectively for the future. SharePoint has led the way in providing a tool to facilitate collaboration within your business and with your customers, manage content, implement business processes and workflow, and provide access to information that is critical to your goals and processes. BTP specializes in SharePoint development and customization. We build client portals, create dashboards that display business-critical information, design report portals and integrate SSRS reports into dashboards. We design, integrate and deploy seamless computing solutions that are built today, but are ready for tomorrow. We create agile, scalable, reliable and maintainable systems. Our aim is to deliver the best possible end user experience. Cloud hosting – We are a Microsoft Cloud Services Partner offering the entire array of Microsoft cloud service, including Office365. Dedicated hosting – We provide full system hosting of your environment. Hybrid (Partial cloud/partial on-premise) – You can mix and match the systems or applications that you maintain and we maintain. Managed services – We maintain your infrastructure in our own facility. BTP provides support for all aspects of your network, including routers and switches to desktops, laptops, tablets and smart phones. We have the ability, and our advanced remote support tools allow us, to offer remote support services regardless of where you may be located, Whether you’re in your office or on the road, as long as you have internet, you have support. Preventive measures – Controls to prevent or reduce the chance of an issue occurring. Detective measures – Controls aimed at detecting or discovering issues. Corrective measures – Controls aimed at corrective action to restore a system in the event of a disaster or other incident. BTP provides guidance and support with setting up full virtual offices or hybrid offices (mixture of traditional and off-site users). We can give you the flexibility you need to run your business. CHANTILLY, VA, October 15, 2012 – BTP Technologies, LLC, a leading developer of custom business management solutions, is celebrating its one-year anniversary with the launch of its new website. "We're excited to be launching our new website to celebrate our one-year anniversary," said Gerald Buenafe, a principal of BTP, in a recent interview. "Clients and partners will find it easy to navigate, and can clearly see the breadth of services we provide," he said. "In September 2011, we acquired the core business of GPC Systems, Inc., a 25-year old business and Microsoft partner that helped customers plan and implement their financial systems," said Buenafe. "It was important for us to ensure our customers that we remain committed to providing the best possible service to them," continued Buenafe. "Our management team and employees were transitioned from GPC, so we've been able to provide continuity to our clients," he added. BTP's principals, Gerald Buenafe, Remi Taneja, and Andy Pirnik, have long prior histories with GPC. Buenafe is the company's Dynamics™ GP Specialist. He has been specializing in Microsoft Business Management Solutions for 16 years. Taneja, Senior Software Engineer, has been building custom solutions that integrate with Dynamics™ GP for more than 12 years. Pirnik is BTP's Systems Engineer and has more than 18 years of technical experience with networking systems and technical support, including systems evaluation, systems implementation, network design, and architecture. BTP specializes in creating business management and financial solutions that integrate seamlessly with Microsoft Dynamics™ GP GP accounting software. "We develop software that is adaptable and flexible, applying the best technologies to our customer's unique business needs," said Buenafe. "We have built custom solutions and financial reports for a wide range of customers, both for-profit and not-for-profit companies and organizations." About BTP Technologies, LLC (BTP) - Established in 2011, BTP Technologies, LLC is a leading developer of custom business management solutions that are powered by Microsoft Dynamics™ GP. BTP specializes in building and enhancing software systems, leveraging new technologies, and integrating business solutions to meet changing corporate needs.